In thirty-four provocative and insightful chapters, the nation's leading planners present a definitive assessment of fifty years of city planning and establish a benchmark for the profession for the next fifty years. The book appraises what planners do and how well they do it, how and why their current activities differ from past practices, and how much and in what ways planners have or have not enhanced the quality of urban life and contributed to the intellectual capital of the field.How have the goals, values, and practices of planners changed? What do planners say about their roles and the problems they confront? What is the relevance of their skills, from design capabilities and environmental savvy to intermediate and long-term perspectives and the pragmatics of implementation? 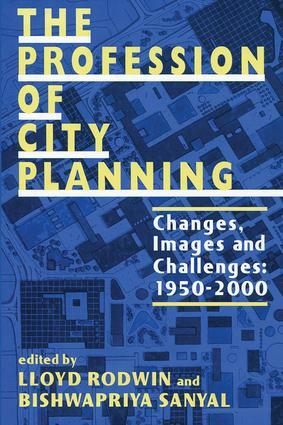 The contributors seeking to answer these questions include Anthony Downs, Nathan Glazer, Philip B. Herr, Judith E. Innes, Terry S. Szold, Lawrence J. Vale, and Sam Bass Warner, Jr.The Profession of City Planning contrasts with the main changes in the US over the second half of the twentieth century in city planning. Sector images of the practice and effects of planning on housing, transportation, and the environment, as well as the development of economic tools are also discussed. Where Have All the Planners Gone? Do Americans Like City Planning?